It’s rare to meet a well-insured Singaporean (given that statistics have shown that the average citizen is severely under-insured), and by extension even more difficult to find a family that is well insured. 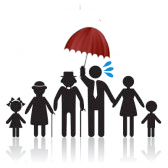 For the few well-insured ones: Being well insured alone does not insure against potential financial ruin if financially dependent family members are not insured properly. In a typical family, all it takes is one uninsured (or under-insured) person and a single unfortunate incident to put the entire family’s finances underwater. Yet, it is common for a family’s decision-makers to overlook or decidedly ignore insurance coverage for the entire family, if they even decide on getting insurance at all. If a child falls severely ill and incurs high hospitalisation costs, it does not matter how comprehensive the breadwinner’s personal insurance plans are – there will still be a high bill for the family to pay. A hospitalisation plan for the child will take care of such bills. If both parents are working and one of the children becomes critically ill, one of the working adults would probably have to quit in order to take care of the sick child. A critical illness policy insuring the child can help with the now reduced family income. If the person falling critically ill is a non-working spouse, a payout would allow the working spouse to reduce work obligations in order to take care of the other and take over domestic responsibilities, or at least hire help. Insuring children is simple enough. Young ones usually do not have averse medical histories to complicate insurance applications, and the premiums are relatively low. In fact, there are policies that insure children for free (yet another reason to visit an IFA) if parents insure themselves. There are some limitations and conditions of course, but it does reduce quite a bit of financial burden for families in expensive Singapore. The tricky part comes with aged parents, who are usually stricken with various medical conditions and more expensive to insure due to age. Worse, they are typically uninsured and cynical of insurance due to generational differences. While medical conditions and costs can be managed to some extent by a competent IFA, the cynicism is something that family members would have to handle. All I can do is to point out the fact that aged people have higher chances of incurring high expenses, be it hospitalisation costs, or nursing home fees or caretaker charges. Such costs fall on the family if they are providing for them. With the shrinking of Singapore’s average family size, this financial obligation also gets increasingly concentrated on each of the fewer number of children. I have heard interesting accounts of people forcing (or even tricking) their stubborn loved ones into getting insured and paying the premiums for them. I am not so sure I can openly applaud their actions, but I would say that they are people who understands the gravity of their family members not being insured. At the risk of sounding like a broken record, a proper financial portfolio for one’s family ought to be constructed. Aside from people who refuse to do so, the sad thing is that there are people who do indeed buy insurance – expensive ones even – for their family only to still be under-insured. I have met someone whose parents bought her a $500 monthly policy when she was young, and passed the premium obligation to her the moment she graduated and started working. She’s not even close to being well insured. Dear oh dear.